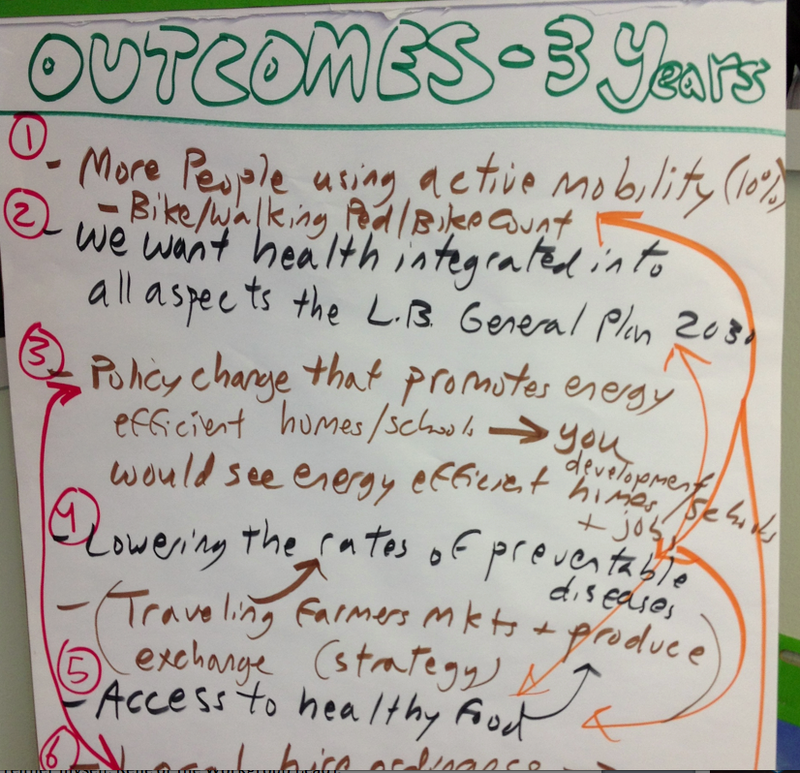 Over the course of eight months, I served Building Healthy Communities Long Beach (BHCLB). BHCLB is a collaborative of a diverse group of partners supported by the California Endowment working together to create sustainable and positive health outcomes in the area of central and west Long Beach, including adult residents, youth residents, faith leaders, community based organizations, school representatives, public health practitioners and many more. I primarily served as a facilitator for BHCLB’s Neighborhoods work group, but I also assisted with their Air Quality work group, Integration Committee and larger Hub community meeting. Working closely with Rene Castro, BHCLB’s Hub Manager, we designed an engaging process that assisted multiple organizations in the room to reach agreement on updating their community plan. 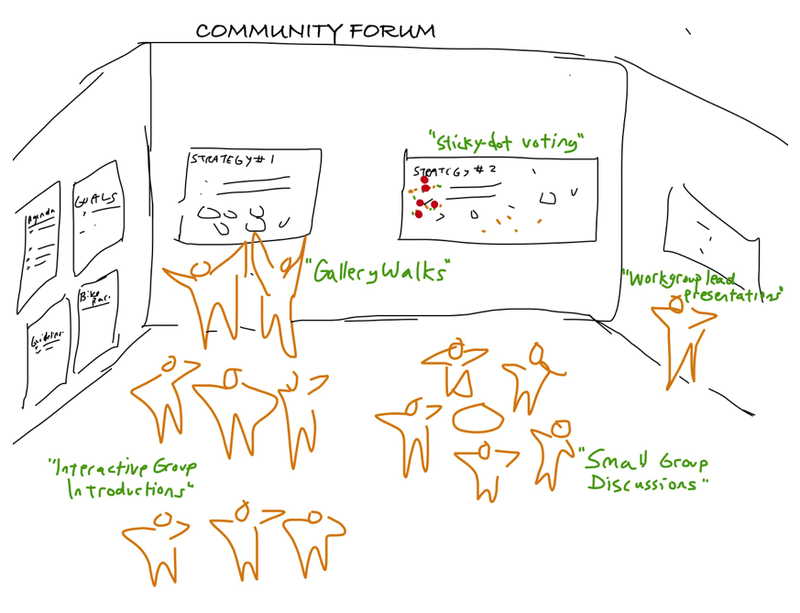 Large group dialog: This format is the typical meeting format, with one person speaking at a time to a larger group of meeting participants. One person facilitates these conversations (either myself, Rene or the Work group Lead). Brainstorming and categorizing: The facilitator asks the large group to generate ideas. The facilitator notes that any idea is a good idea – judgment is suspended until later. After the brainstorm, the facilitator asks, “What ideas relate to each other?” The group usually identifies and combines some ideas that are similar. Note I write different suggestions in different colors to make them easier to read. 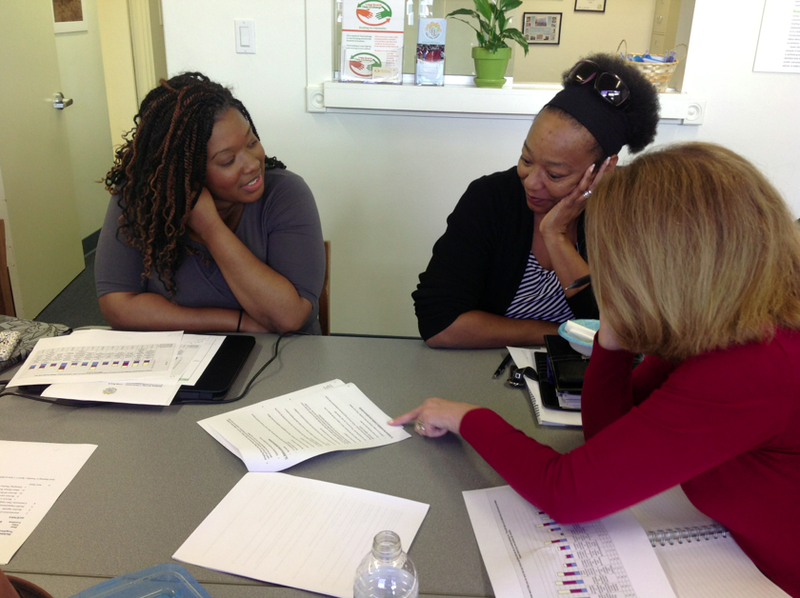 Small group work and report back: Often times, the large meeting group split up into smaller groups. Sometimes, each of these groups would work on the same task (ex: generating ideas for which strategies to pursue), other times small groups would work on different sections of the same task (ex: reviewing and summarizing different sections of the survey). After the small groups completed their tasks, the large group reconvenes and the facilitator supports a debrief. Gallery walk: The facilitator posts different poster papers around the room, each with a different heading (ex: capacities, resources, strategies, etc.). The facilitator gives the group anywhere from 5 to 15 minutes to visit each station and write down their own comments on the poster paper. World Café: Similar to the gallery walk, the facilitator sets up different stations, with each table containing a poster paper. Small groups form and each group visits all tables, commenting and voting on the papers (ex: voting whether or not different strategies met the BHC criteria). Post-it notes: During gallery walks, World Café and sticky dot voting, if participants have additional comments, they write them down on post-it notes and stick them to the appropriate section. 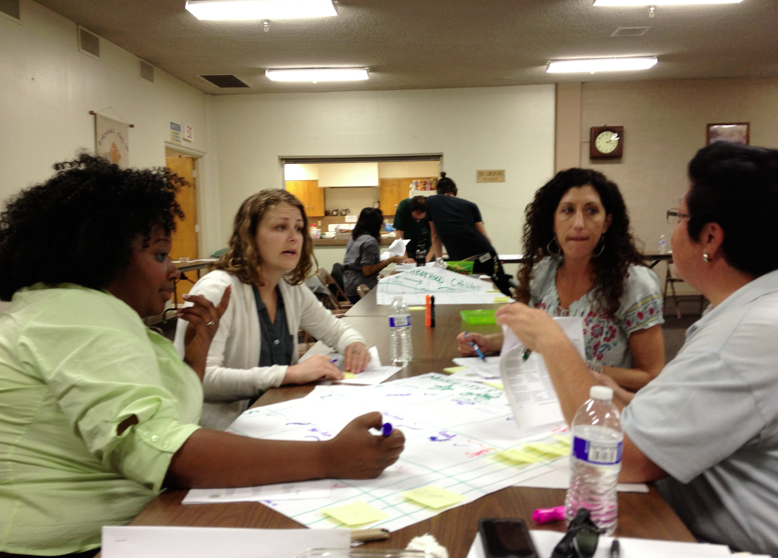 Graphic Facilitation: Using graphics (such as charts/pictures/Venn diagrams/metaphors (“steps in the process”), the facilitator helps visualize information and the interconnection among topics discussed by the group. Individual reflection time: The facilitator asks the group to consider a question (ex: what do you think is the most important targeted change this work group should focus on?). Rather than having the group immediately discuss it, each participant is be given a piece of paper and a few minutes to gather their thoughts before sharing. This activity helps balance participation in the group (giving more introverted members the opportunity to voice their thoughts). 1-2-4 Individual/paired/small group work: This method helps groups engage with each other and prioritize at the same time. It starts out with individual reflection. Then individuals are then paired with another and they are asked to find the common ground between their two ideas. Groups of two then form into groups of four, with each pair sharing their common theme. The group of four is then asked to find the common them between the two. This is an organic way to build consensus from the individual back to the whole group. 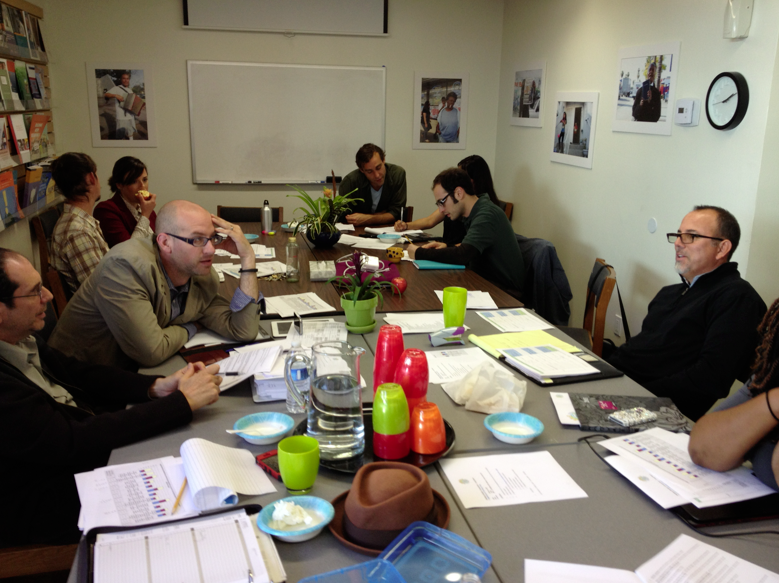 Openings and Closings: At almost every meeting, the chair led the group in an opening that involved all participants. The opening usually included, “Share your name, organization and one update you have since the last meeting.” Before closing a meeting, the facilitator often asked everyone on the group to comment on how they are feeling about the process, asking everyone to summarize their feelings in one or just a few words (in the interest of time). Both of these activities generated full participation from all participants present, an important, inclusive activity so all voices could be heard. Check in: This activity asks all participants to share how they are feeling about either the process or decisions being made. Like the openings and closings, the check-ins provided an opportunity for everyone to participate while also getting a sense for the “pulse” of the group. Sticky-dot voting: This decision-making tool helps a group narrow a large number of options into a smaller number. Each participant is given on average, 3 to 5 of stickers to vote on a choice of options (ranging from 10 to 40). The stickers also help capture the “pulse” of the group. Multi-voting: This decision-making tool is a little more complex than sticky-dot voting. 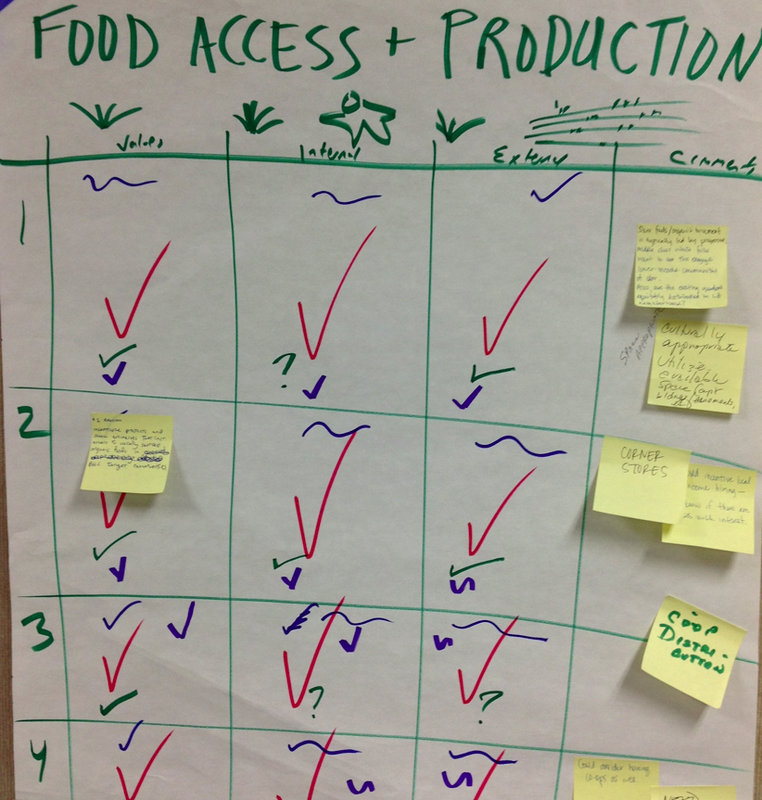 Instead of using sticky dots, members rank potential choices against a set of criteria. In our case we used a check mark if it met the criteria, left it blank if it didn’t meet the criteria or put a squiggly line if it partially met the criteria. Testing for Consensus: The facilitator asks the group if anyone has any concerns about what was being voted on. If anyone has any concerns, the facilitator asks if anyone else in the group could address those concerns. If the concerns are addressed, the facilitator then asks if the group had consensus on the decision. If the concern is not met, then discussion continues until the issue is resolved. If there is no concern, then the facilitator would test for consensus. 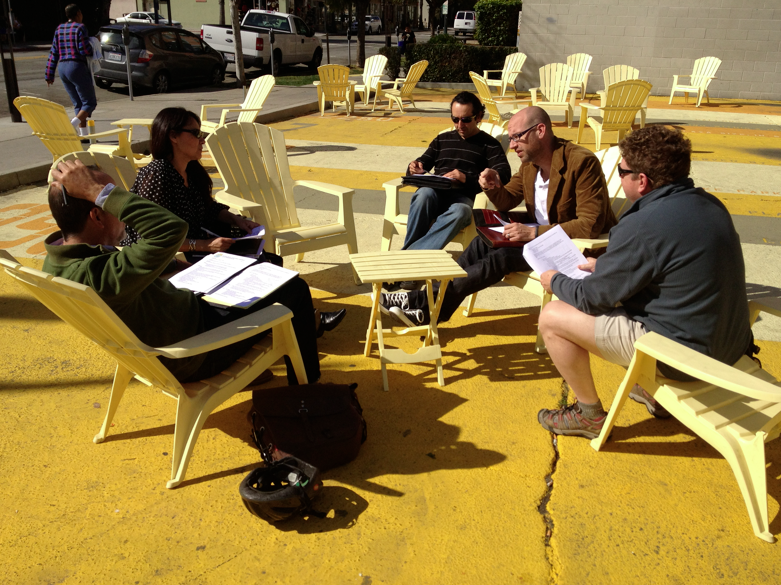 Outdoor meetings: Why meet inside all of the time? While most of our meetings were inside, we did have one memorable and productive meeting outside in a public space that spoke to the values of BHCLB – a former section of parking lot converted into a vibrant public space. Meeting as a small group outside, we accomplished a great deal in a short amount of time. I look forward to using these processes with other collaborative change efforts, along with experimenting with other engaging methods to build consensus among a diverse set of organizations participating in a larger effort. For more tips on process tools, see my “Alternatives to Group Discussion” handout along with my other handouts on facilitation. 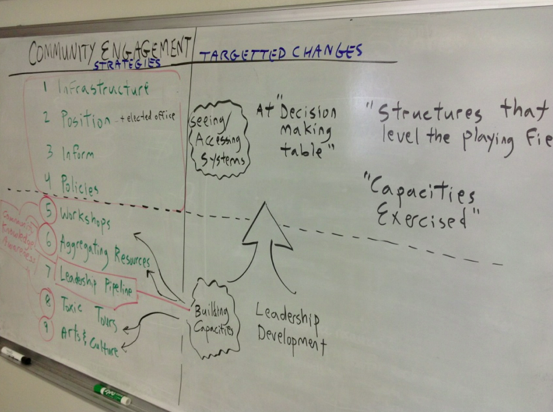 This entry was posted in Collaboration, Facilitation and tagged #Nonprofit, Clients, Collaboration, Community, Facilitation, Leadership, Sustainability, Team Building. Bookmark the permalink.